A slipping clutch can be a very serious and top-priority problem. This can happen when the clutch disc is not being held against the flywheel tight enough. Ignoring a slipping clutch could lead to other problems including problems with your transmission. 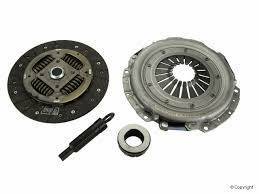 Any suspected clutch problems should be brought to the attention of our trained clutch repair specialist. There is a simple, straightforward way to test for clutch slippage. First, start your car with the parking brake in effect; then try to stall the engine. Then, release the clutch pedal without pressing the gas pedal at all. The longer the engine runs, the worse your clutch slippage problem is. Clutch problems can arise with eventual wear-and-tear, and should be addressed immediately. Grease and oil leaks can also result in a slipping clutch. Check the crankshaft and transmission input seals for any possible leaks. If you notice anything out of the ordinary call Peninsula Automotive today to arrange an inspection.